This morning a friend, Steve Gamlin, who is a motivational speaker, asked his Facebook friends “QUICK!!! What act of kindness can you commit and post here in the next 5 minutes?? :)” My response was that I would greet everyone I met today with a smile. Despite my not having been feeling quite myself for the past couple of months, I knew that this was a task that I could easily accomplish. Smiling is easy, with the right mindset of course. I read a little into what he was asking, making the assumption that what he was looking for was an act of kindness that would make a difference in another person’s life today. What I observed, and knew from experience, that kindness set in motion will create further kindness throughout the day to those you encounter. So, the first smile had to be at myself in the mirror. Have you ever intentionally smiled at yourself in the mirror? I have to admit, I don’t usually go to the mirror to smile as I tend to use the mirror to groom and make sure things are in place. But today, I took time to genuinely smile at myself. Then I proceeded to go about my day. The first people were family members, my husband when he returned from a dental appointment, prior to going back to work, and my daughter who was leaving to return back to college. Okay, those were easy recipients of a smile, from a wife and mother. But, I love the hugs and kisses that always follow. Family smiles are genuinely filled with love, gratitude, warmth, and joy…well, the list goes on. I simply adore my family. After the house was empty and I headed out for an appointment to my dermatologist. When you greet a receptionist with a smile and a kind attitude, you receive the same in return. While in the waiting room, I met an elderly couple where we smiled and exchanged some comical humor. As I was called in, the elderly gentleman was first to extend his wishes for me to have a great day. I love elderly people!! The MA was sweet as always, and my MD whom I have a great deal of respect for, was kind with his great sense of humor intact. I left, as I always do, wishing him as well as his staff, a great afternoon. Upon arrival and departure I was treated with respect. Okay, that was nothing out of the ordinary for me at this office. But still, kindness was extended and received. No, I did not say anything to the grumpy lady, nor did I make her apologize, yet I did smile at her when she first came up. I did not let her go in front of me either. There was a little guilt, but not much. Had she not been so mean and loud with her words, yet quietly shared her need to get back to work or something, I would have been more than happy to let her go before me as I was in no hurry. Instead, I chose to greet the cashier with a smile, have her process my return and wish her a great day. I find it interesting how the cashier still greeted “Ms. Grumpy” with the same pleasant manner as she did me, which she surprisingly received a kind response from “Ms. Grumpy”. All I can say is that people are interesting. But, it also points something important out. How you present yourself, is how you will be perceived. Unfortunately, if you are going to be unkind to people, you could potentially miss out on a blessing. In this case, getting out sooner had she been nice. We have two banks in which we do business with. Both banks are small and have the greatest customer service. We are always greeted with a smile and they always address us by first name. So this was an easy place to smile and be kind. Then, I decided to do something nice for my husband. I had this coupon for Dunkin Donuts, where if I purchased a beverage I could get a free donut. 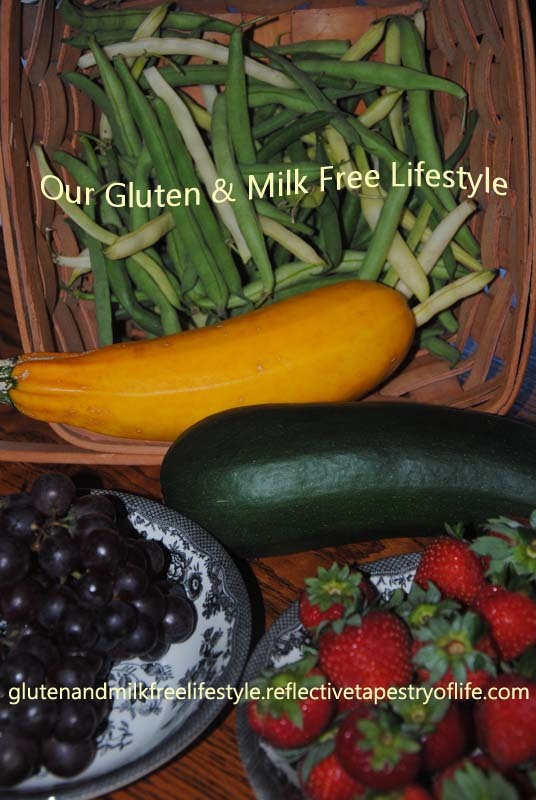 What you need to know first is that I only bake gluten and milk free foods in my home. My husband does well with this diet, yet from time to time, he really appreciates food from the “other side”. I was not feeling the greatest and wanting to get home, but I stopped and picked up a Raspberry Iced Tea for myself and a free chocolate cruller, his favorite. The cashier was a little slow, but another girl came forward and asked what I was looking for. To help things along, she got my Iced Tea and by the time she got that, the cashier was able to get the donut and ring me out. Smiles were exchanged. This is just too easy!! On my way out, I stopped to get a straw and a few napkins. Not realizing it, but another customer stopped to hold the door for me. When I looked up, I was amazed at his kindness as I was not “right behind him”, but rather taking my time. I smiled, apologized for making him wait while thanking him for his kindness for which he shared “no problem”. Before I left the parking lot, I had received three smiles and a young man holding the door for me. I scored big time!! Although I had not personally received any negative responses to my smile and kindness in speaking with others, I was still not feeling the greatest, as the return of a headache was beginning to make its presence known. So, I called my husband and asked him if he could meet me outside in about three minutes. As I drove in, he was there waiting, not really expecting anything but a quick kiss and hello. You know that smile I promised I would give away all day? Well, I always seem to get the best smiles from my family, but there was nothing more fun than seeing my husbands’ face light up when I brought him this treat. I came home tired, yet feeling as though there was more that I could do. For the past six weeks, the recycle men have been stacking our bins and bringing them to our deck, as a result of a windy day in which I emailed and shared how I was unable to chase down the bins and lift them due to a recent shoulder surgery. The manager was quite generous in sharing that he would have his men stack them for me. Well, these guys went above and beyond by also bringing them to the deck, something more than was expected. In appreciation I chose to bake them some cookies today, yet made plenty to share. When the guys arrived and received a smile and a plate of cookies, not only was there a smile but there was a little kick to their return to the truck. There is nothing better than being noticed for one’s service, which this team had gone above and beyond in doing. They deserved more, but what I had to offer was obviously appreciated. As my neighbor returned home from work, I was able to bring him a plate of cookies as well, who shared what a great neighbor I was. Our neighbor is not just your ordinary neighbor, but a friend as well. In today’s culture, it is rare to have neighbors that do things for one another, but we are fortunate for his friendship. John is more like family to us then just a typical neighbor. My husband returned home from work to a plate of cookies for himself, which okay, I got a few extra hugs and kisses for, but that’s a given. I don’t bake goodies often, yet when I do, there is extra appreciation for the effort put in. It also means there are treats for his lunch the next day. Apparently, the gift of smiles was not finished. We needed to head out to pick up a few cards, a few groceries and fill our tank with gas. Those we met, whether cashier, retriever of carriages, or others along the way. Politeness and smiles had a domino effect. A smile never goes unnoticed. Although not everyone in the world today is happy, and some think the world revolves around themselves, it is up to us individually to make a difference in our daily walk. 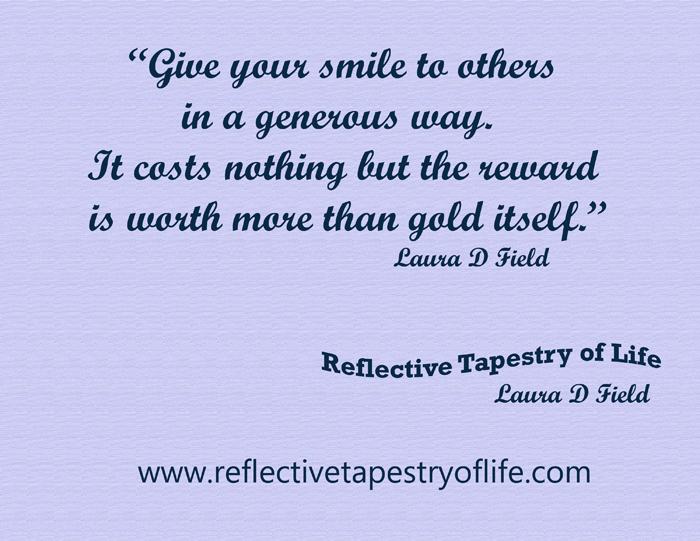 Give your smile to others in a generous way. It costs nothing but the reward is worth more than gold itself. This entry was posted in Life, Positive Thoughts, Today's Thoughts and tagged attitude, giving, kindness, life, reflective, smile, tapestry. Bookmark the permalink.